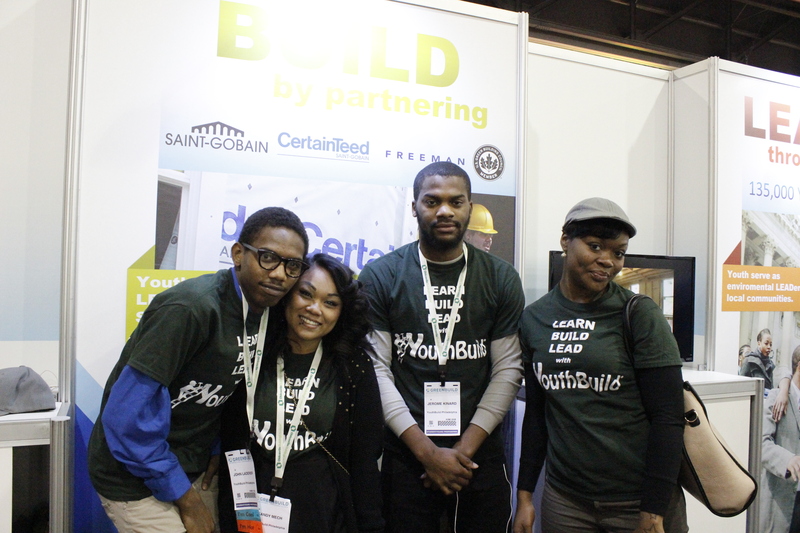 YouthBuild at GreenBuild in Philly! This year, Philadelphia was the proud host city for the international GreenBuild 2013 conference, where for three days thousands of people – planners, architects, contractors, builders, developers, students, scientists and more – convened to meet and learn from each other to advance the green building and sustainability movement. With the conference only a few subway stops away from YouthBuild Philly this year, we were able to send two squads of green construction and advanced construction students to the conference! In exchange for volunteering for eight hours each and stuffing 8,000 conference tote bags as a team, 24 students had the opportunity to attend the conference and vendor’s Expo for all 3 days. Each of these participating students will work on the LEED-targeted rehabilitation of the Wingohocking St. properties in the Nicetown section of Philadelphia. The GreenBuild conference offered them an opportunity to learn more about the broader sustainability movement as well as innovations and career opportunities in green building. Green Leasing: The Split Incentive – Real or Red Herring? Additionally, students staffed the YouthBuild USA booth for 5-6 hours each, engaging Expo attendees and answering their questions about the YouthBuild model and YouthBuild Philly’s green building program. Students were excited to work alongside YouthBuild alumni from around the country and represent the national YouthBuild network. To prepare students for the conference experience, we worked with the Delaware Valley Green Building Council and Saint-Gobain to arrange a mentoring lunch in which students could network with sustainability professionals in the region (including staff from Saint-Gobain, Solar States and CertainTeed, as well as local developers and architects) and discuss the GreenBuild conference as well as sustainability initiatives and careers. City of Philadelphia Director of Sustainability Katherine Gajewski and USGBC Senior Vice President Kimberly Lewis also attended the lunch and delivered remarks. Many of the “mentors” who attended the lunch were also presenters at the GreenBuild conference, and some students followed up on the lunch by attending their presentations during the conference. We believe that the truest measure of success for our program is demonstrated through the long-term success of our graduates. We value our green building construction initiative because of its relevance to the labor markets our students will enter. Surveying the Expo Hall at GreenBuild, it is clear that businesses and employers will continue to innovate and grow in the direction of sustainable products and practices. This opportunity for students to practice networking and explore career paths in the field of sustainability prepared them not only to join the next generation of green builders, but also to pursue and succeed in any field they might choose. We are so grateful to our partners Saint Gobain, CertainTeed, YouthBuild USA, Delaware Valley Green Building Council, US Green Building Council, and Freeman for making this standout opportunity possible for our students! Next Post [Fall School Edition] Congratulations Class of 2013!